Indian Ecommerce space has been growing consistently over past few years, and is expected to grow even fiercely in coming years. However, it is dominated by one sector – Online Travel Booking. Infact, OTA command more than 80% of all the entire Indian Ecommerce Market share. By December 2011, it is expected that Ecommerce in India will touch 47,000 crore, out of which 37,890 cr. is spend online on travel alone! Comscore recently released the growth figures for Online travel audience in India, and it is clear that online travel audience are growing at much faster pace. According to the report, Travel Site visits grew 32 Percent in the Past Year and Indian Railways got majority of these visitors. In April 2011, 18.5 million online users age 15 or older visited a Travel site from a home or work location, an increase of 32 percent from the previous year. Each of the top 10 websites in the Travel category experienced strong growth in the past year. Indian Railways led as the most-visited Travel destination with 8.4 million visitors, an increase of 8 percent from the previous year. Online Travel Agencies (OTAs) secured the remainder of the four top spots in the category. MakeMyTrip reached nearly 3.9 million visitors (up 63 percent) followed by Yatra Online with 3.5 million visitors (up 82 percent) and ClearTrip.com with more than 2.1 million visitors (up 80 percent). U.S.-based Expedia Inc. secured the 5 position with 1.8 million visitors (up 12 percent). MustseeIndia & Redbus were the two sites which grew at much faster pace than other travel sites. 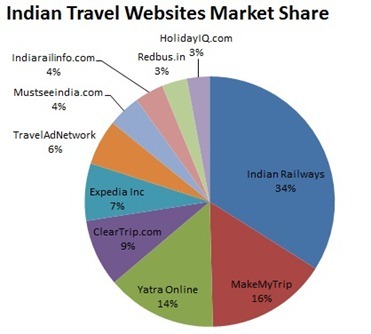 It is interesting to note that of the 7.1 million people visiting the top three OTAs, MakeMyTrip, Yatra Online and ClearTrip.com, in April, more than 2 million users (29 percent) visited two or more of the three sites. Among the remaining 71 percent of visitors checked in at only one of the three sites during the month demonstrating relatively strong brand loyalty among the top players. I am surprised not to see ixigo.com in the list of top 10 travel websites – and quite surprised to see little known websites like MustseeIndia and Indiarailinfo! Top 4 Must-See Historical Places in India! Thank you for sharing the wonderful information for us.Your article is very informative.Nice post. Very heartening to see that e-commerce is catching up in India too. There is no doubt that one day India along with China will dominate the e-commerce industry of the world. With just around 8% internet penetration (and majority of them having little knowledge of e-commerce) – Indian e-commerce industry is $10 billion + , one can’t just imagine what will happen if that penetration rate reaches the first world level (please read U.S, Canada, Japan)! No wonder the US retailers like JC Penny and Zappos alone equals to India’s gross e-commerce market! I think Indian retailers too should/could cash in in a very very big way. Glad to see mustseeindia.com in top 10. Arun – Must See India is relatively a new site that is catching up fast with old timers like HolidayIQ and Trip Advisor in Travel information space. Bet you'll see it more often now! This data is consistent with a similar report by Toonz earlier this week – http://www.tnooz.com/2011/05/29/data/top-travel-websites-in-india-may-21-2011/.